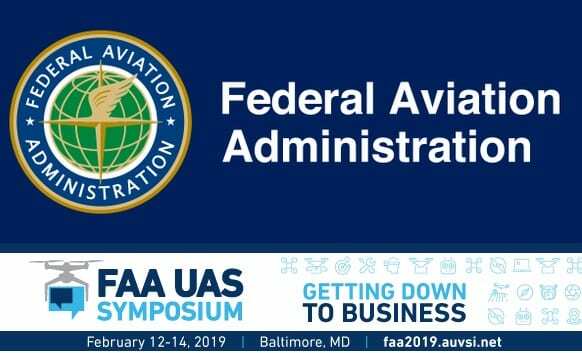 Federal Aviation Administration (FAA) and the Association for Unmanned Vehicle Systems International (AUVSI) invite drone owners and operators to join an important national conversation on drone integration at the 4th Annual FAA UAS Symposium, February 12-14, 2019 at the Baltimore Convention Center. FAA and AUVSI bringing stakeholders together from all sectors to help define the rules and concepts that will govern the future of drone operations. •	Discover how FAA and AUVSI are working together to establish partnerships and identify the responsibilities, education and tools our partners need to be successful in their roles. •	Hear the buzz about what’s next in drone technology and what it means for the future of flight. As urban air mobility, package delivery and beyond visual line-of-sight (BVLOS) operations are taking off, the FAA is making continuous progress toward safely integrating drones into the National Airspace System. •	Learn about new developments that will help you conduct more complex drone operations. •	Engage with your colleagues and leaders in the drone community! The new website is officially launched in seven languages (simplified Chinese, traditional Chinese, English, French, Japanese, Korean and Russian) for the world to see China beyond imagination from a new aspect. A series of four earthquakes measuring up to 6.0 magnitude have hit off the coast of the island of Sumba in Indonesia. Commissioner of Tourism for the US Virgin Islands, Beverly Nicholson-Doty, sent this message on the occasion of World Tourism Day.